Wheel balancing weights and accessories for tyre shops Italmatic produces a complete range of wheel balance weights for OEM and the spare part market, next to which it put the distribution of consumables for mounting, assistance and repairing of tyres (accessories for tyre shops). The range of Italmatic tire shops accessories and repair material for tire shops includes 2000+ items of high quality, addressed to professional users. Italmatic wheel balancing weights are produced according to quality system ISO 9001 and ISO TS for OEM; the range of wheel balancing weights includes: • wheel balance weights made of steel (adhesive and clip-on); • wheel balance weights made of zinc (adhesive and clip-on); • wheel balance weighs made of lead (adhesive and clip-on; for car, truck, motorcycle); • wheel balance weights made of tin (adhesives). In the spare part market Italmatic wheel balancing weights are distributed through distributors skilled in this field, while in the OEM market they are supplied directly by Italmatic. Besides the range of wheel balancing weights (produced entirely in Italy), Italmatic distributes important brands of accessories and tools for professional usage in tyre shop, among which: • Patch Rubber (USA) branded tire repairing material; • Alligator (Germany) branded tire valves; • Ruff (Germany) branded truck tires re-groovers and blades; • Wonder (Italy) branded tyre inflating guns and gauges; • Mega (Spain) branded jacks and lifting trolleys; • Schrader (France) branded repairing material, valves, TPMS. • etc. Through a capillar network of distributors, Italmatic products are sold practically all over the world. If You are end users (ex. 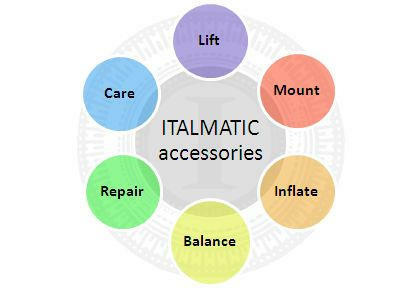 tyre shops) and You do not know the distributor to whom addressing Yourselves for the purchase of Italmatic consumables, or if You are distributors interested in representing our program of accessories, contact us and we will give You all necessary information.